The world rests on three pillars. On Truth, on Justice and on Peace. The three are really one. If Justice is realised, Truth is vindicated and Peace results. Rabban Simeon Ben Gamaliel. 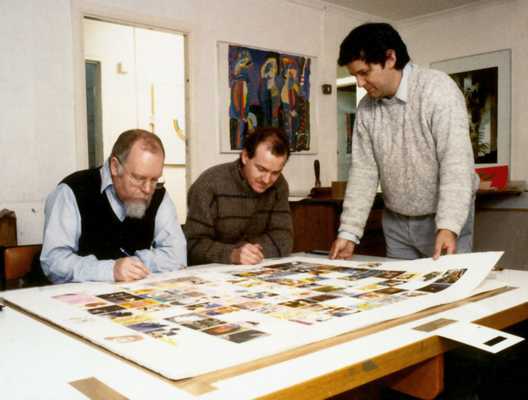 In an exciting new fund-raising project, artist Graham Bannister has created a human rights painting, the proceeds of which will go to the HRI to help fund future projects. 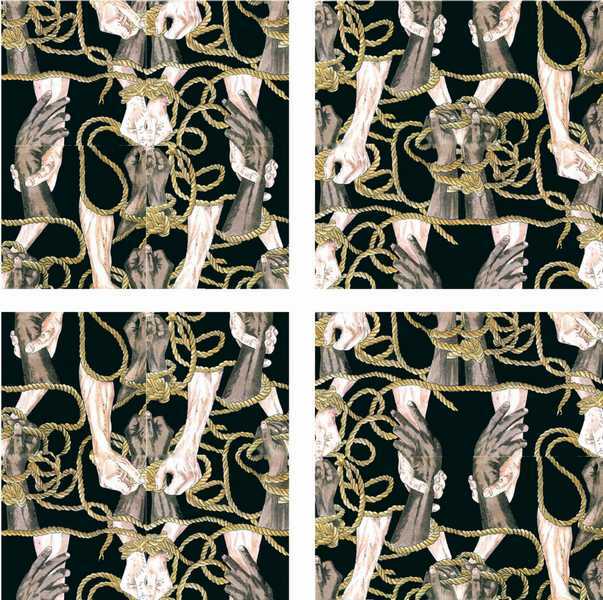 The work shows hands pulling together on ropes to untie the problems of the world. These are the problems where the rule of law, natural justice and fundamental human rights cease to exist as a result of political, economic, social or military pressures. The hands represent human effort and energy exerted in unison. On each pillar are the words Justice Peace and Truth written in the six official languages of the United Nations. Global voices from all corners of the world are represented in the picture, as they are in the membership of the IBA. We believe that this painting reflects the IBA and presents a positive but realistic depiction of the global human rights situation. The significance and meaning of the work is directly related to the aims and ideals of the International Bar Association's Human Rights Institute. 1.The promotion, protection and enforcement of human rights under a just rule of law. 2. The promotion and protection of the independence of the judiciary and the legal profession worldwide. 3. The worldwide adoption and implementation of standards and instruments regarding human rights, accepted and enacted by the community at large. 4.The acquisition and dissemination of information concerning issues relating to human rights, judicial independence and the rule of law. 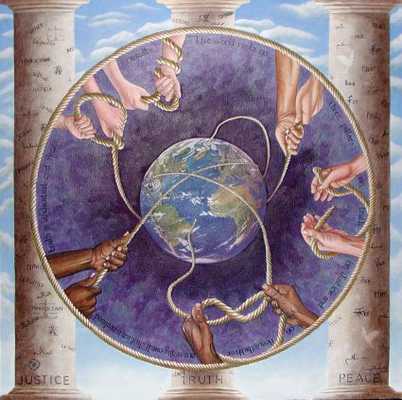 The work shows hands pulling together on ropes to untie the problems of the world. These are the problems where the rule of law, natural justice and fundamental human rights cease to exist as a result of political, economic, social or military pressures. The hands represent human effort and energy exerted in unison. The hands are a mixture of nationalities, of men, women and children. Ropes are made of many individual fibers and strands. When entwined they increase in strength. The ropes also symbolise restrictions and shackles. Untie the knots and freedom results. Ropes are strong, flexible and have many good uses. They can, however, be abused. 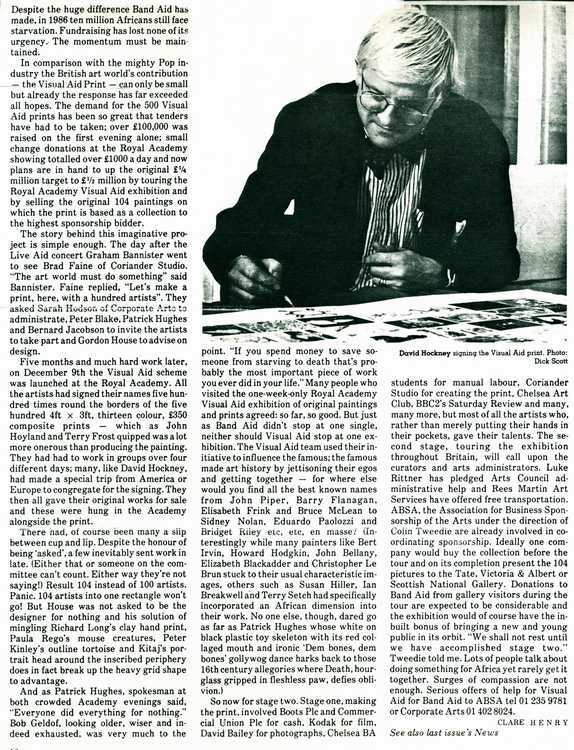 The work shows these ideas are global but even our world is set in the large universe of space. 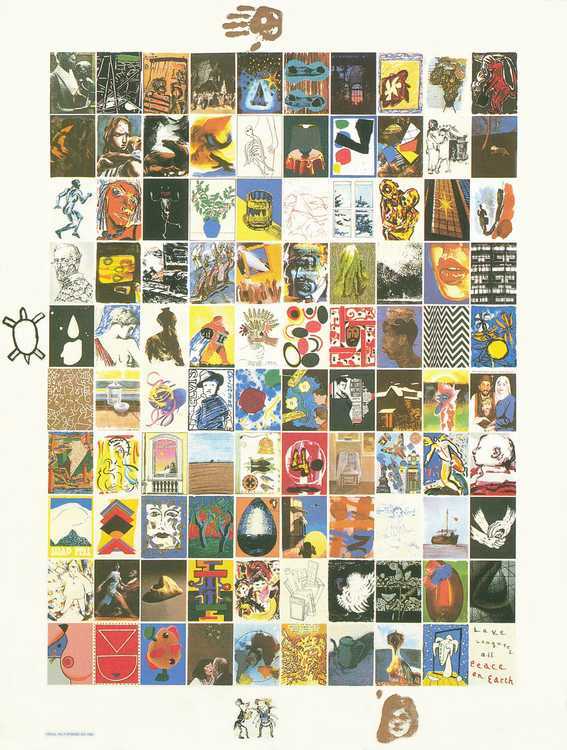 Contrast this with the individual human endeavours represented by each individual hand. All these symbols are set against the three pillars. These support the three key principles. On each pillar are the words Justice, Peace and Truth written in the six official languages of the United Nations. The three pillars are connected to and support the universe in which the world revolves. Behind the pillars is an expanse of sky depicting freedom and space. The sunlight, fresh air and water bearing clouds are essentials for life itself. Each card is made up of 4 panels by moving the panels you untie the hands. the white person unties the black person, then they become friends. 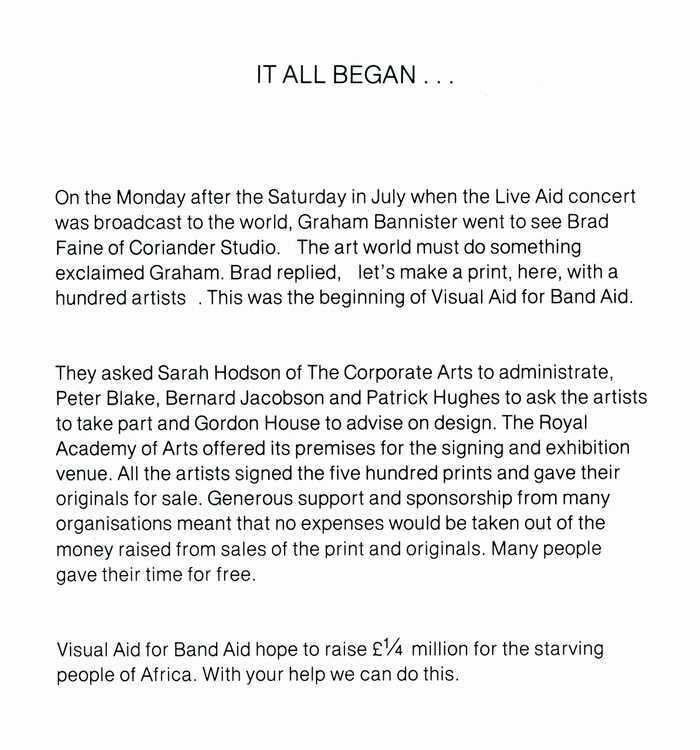 A 104 British Artists helped raise money for millions of people starving in Africa. 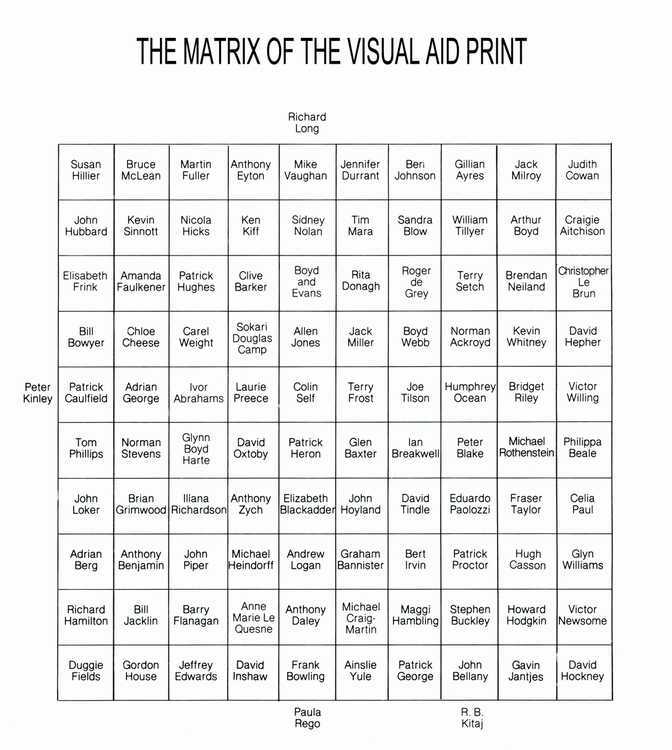 A limited edition Silkscreen print was produced with a 104 images signed by all the Artists. 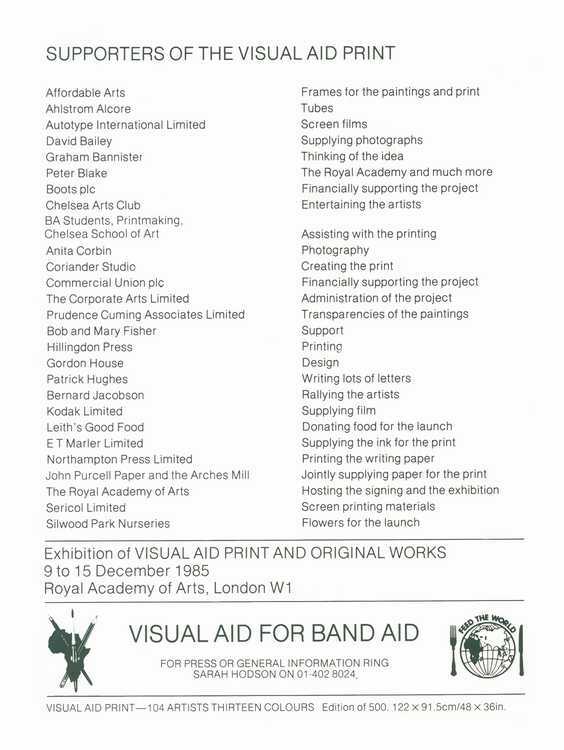 The launch was held at the Royal Academy in London with an exhibition of the 104 original art works. 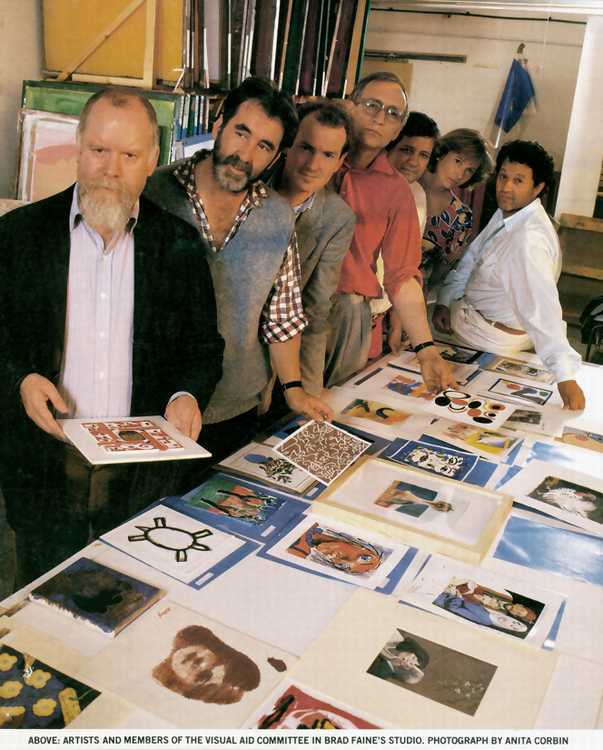 Peter Blake, Graham Bannister, Brand Fane for the first signing.